I am oddly entranced with this Pink Dot Tea Dress which I found on the sale section of the Boden site (I went there last night to look for v-neck cardigans, which are on my "want" list for fall … and got distracted by the on-sale stuff). It's only available in limited sizes, and only in pink, but … it's cute! Click on the tiny image to visit their site and see a zoomable picture. Boden calls this a Spotty Tea Dress, but that makes me think of less-pleasant things, so I will just call it a Pink Dot Tea Dress, if that's all right with y'all. Not that I don't spot myself with tea on a regular basis (drinking iced tea all day long as I do, and not being the most graceful of persons). And occasionally I'll spot other people to an iced tea. And more often than I like I break out in what the Brits call 'spots'. But I don't think I want a dress to remind me of that. I only have one boden dress, and was surprised at how well it fit (I have trouble with off-the-rack dresses). But Boden generally works out very well for me, so maybe not that surprising. I have been eyeing that, um, pink dot dress since it came out, but have so far resisted it. I did buy a load of skirts this year though — they’ve finally added pockets to most of them!! 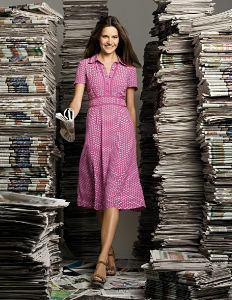 I’m a little disturbed by the piles of newspaper in the background of the picture. Are they trying to market this as a snappy outfit for compulsive hoarders? Sweet dress…wish they still had it in brown! For a moment I was really excited because I thought the title of this post meant that the dress was for *me*, not for the time of day that involves the beverage. Even still, this dress pretty much *is* one for me anyway. It would go really well with my pink clogs. Boden has been pretty much ruined for me by the fact that a certain type of affluent 30-something yummy-mummy smug-marrieds are now being nicknamed “Bodens” by the media here. And not in a positive way. They do have some pretty dresses, though, although they all scream “Boden” so loudly you might as well print it across the front. I have that dress in green! I wore it yesterday and it made me happy. I do wish it had pockets though. you know, it wouldn’t be that hard to open the seam and add a pocket. You could make the pocket out of white broadcloth (or even try to match the pink.) Side seam pockets are pretty easy to put in. It is a pretty dress and they have it in my size. Too bad I’ve already spent my clothing budget for this season. i have the dress w/ the pockets. i love it! The style is cute. The trim sleeves and the graceful sweep of skirt looks comfortable to move and sit in. But with the waistband rising up in the center front as though even a pancake-chested model were direly in need of an FBA I can’t imagine that the fit would be good on any normal woman.I may copy that, with the waist siting correctly, in some black/grey/red stripe fabric I wanted to make up into a pretty but practical dress for a warm, NC fall. speaking of cardigans…i’ve been looking for a cardigan pattern…do ya’ll know of any good ones? I’m surprised you say “oddly,” Erin. It surely smacks of Duro, don’t it? Right up your alley. Oh I’m also drawn to Boden clothes, but haven’t had the courage to buy anything, even on sale. I’m not great with the interwebz shopping me. Need to try things on. Lovely dress though – but I agree about the background being funny! I looked at this dress and immediately thought, “I bet that high-waist button-down front would be awesome for mid-pregnancy and breastfeeding!”I think I have babies on the brain, not just in the uterus. 🙂 And I think I may have to get to work finding a pattern that will be adaptable to this. Any suggestions? Thanks for the recommendation, 3KillerBs. This is my first experience with baby/nursing clothes, so it’s useful to get a different perspective! I will have to check out Elizabeth Lee 108-109. I bought that dress in green and wound up returning it. Do not buy it if you are tall/long waisted. (I am both.) On the model, it looks like the waist is set just a tiny bit above her natural waist. On me, the bottom of the waistband hit about three inches above my waist– not quite high enough to be an empire style– instead it just looked dumpy. I’m 5’8″ so I’m hardly a giant who doesn’t fit into clothes. On the other hand, the dress was generally well made and the fabric of good quality. I own that dress and it’s my new favorite. The sizing is dead on and it washes beautifully. Everything I’ve gotten from Boden has been quality and their customer service is first rate. I’d never heard of Boden, but I went over to check them out, and was pleased to note they had dresses in long sizes. Thanks for the tip! Erin, Target has a few v-neck cardigans. The short-sleeve Mossimo one was about the best of the lot (IMO). It also comes in a three-button bolero-like version which is better with dresses.If you find a pullover v-neck in a thrift store, it’s not hard to make it into a cardigan…just takes bloody-minded ruthlessness, grosgrain, buttons, and a pair of shears.